Every day, large quantities of volatile organic compounds (VOCs) are emitted into the atmosphere from both anthropogenic and natural sources. The formation of gaseous and particulate secondary products caused by oxidation of VOCs is one of the largest unknowns in the quantitative prediction of the earth’s climate on a regional and global scale, and on the understanding of local air quality. To be able to model and control their impact, it is essential to understand the sources of VOCs, their distribution in the atmosphere and the chemical transformations which remove these compounds from the atmosphere. In recent years techniques for the analysis of organic compounds in the atmosphere have been developed to increase the spectrum of detectable compounds and their detection limits. New methods have been introduced to increase the time resolution of those measurements and to resolve more complex mixtures of organic compounds. 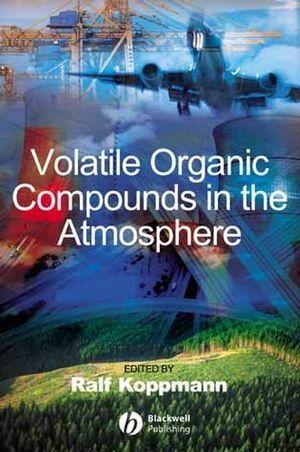 Volatile Organic Compounds in the Atmosphere describes the current state of knowledge of the chemistry of VOCs as well as the methods and techniques to analyse gaseous and particulate organic compounds in the atmosphere. The aim is to provide an authoritative review to address the needs of both graduate students and active researchers in the field of atmospheric chemistry research. Ralf Koppmann was until recently deputy director of the Institute for Chemistry and Dynamics of the Geosphere, Institute II: Troposphere at the Research Centre Jülich, Germany and is now Professor of Physics and head of the Atmospheric Physics Department at the University of Wuppertal, Germany.